Foxconn's CEO Terry Gou must feel like he's dodged a bullet, after labor conditions scrutiny all of a sudden shifted to Apple's other major assembler, Pegatron, which is in charge of putting together products like the iPad mini and the budget iPhone that's coming later in the year, but Macs as well. The non-profit China Labor Watch organization has tagged Pegatron for inhumane working conditions in factories it operates. The watchdog group found out negligence on part of management for how workers are compensated, resulting in the vicious spiral of more and more extra hours clocked in. The observers noted employees logging a 66 to 69 hours workweek in the largest Pegatron facilities, whereas Apple has set strict guidelines of no more than 60 hours for its assemblers, plus the overtime has to be voluntary on the worker's part. The team from Cupertino reacted immediately to the report, and sent audit teams to review the working conditions in those Pegatron factories with the statement that Apple "is committed to providing safe and fair working conditions throughout our supply chain.... [This] report contains claims that are new to us and we will investigate them immediately ... If our audits find that workers have been underpaid or denied compensation for any time they've worked, we will require that Pegatron reimburse them in full," said Apple's spokesperson in Bejing. Of course, once the auditors are there they surely will make everything look like everything is fine. Dumb Apple! Of course they will. heres how it may go Step 1: set time for Apple to visit. Step 2: Clean factory. Step 3: Tell All empoyees they must pretend to be happy or they will be fired Step 4: Hide working kids and elderly during scheduled visit. Step 5: ??????? Step 6: Profit! you can repeat that again brother.. hahahaha.. dumb apple.. really dumb.. Even with guidelines, constant 60 hour work weeks are still brutal for assembly positions. I sometimes work 70+ hrs. But it is never consistent. I value a rest period. John B.
I drive county transit here in Las Vegas, and we're constantly forced to work overtime, it's in our CBA. I hate it, but OT happens. We routinely get 30-50 OT hrs a week. Makes for a very nice check though. The problem is their OT may not be paid, their basic salary has already been delayed. Apple should do the right thing to move part of their production back to the states, There are transport saving and a large US market. After reading the highly intelligent second part of your post. What was the point of the first part? He wanted to point out that it is ironic how people spend so much money for an idevice where a worker outside US that assembled it can not even afford it - and is forced to work harder and harder in order to bring "fruits" to Cuppertino...the most painfull thing is how apple sets skyhigh prices and earn that much money on single idevice....rubbery!!! Exactly bro. They only notice apple, and turn a blind eye to everyone else. You dont see the point - not Apple only, you can find Made in China everywhere - it doesnt mean what comes from China is bad, they can also produce very good quality products - iPhone might be the evidence. But in regard of content of this portal - phones, i mean all other big players, if SAMM, HTC or SONY...they also produce in China, Taiwan - people also working cheap for them, but more of the profit goes home...to China or Taiwan, Korea... ...i wrote, that people work cheap for Apple factories, all the SkyHigh profit goes to US mainly - so go Americans, make your own iPhone and be proud owner of the iPRODUCT. How many of you would work the same way as they do? But thats the way it works - not only in phoneindustry. I dont mean to p**s you off guys from US, but sometimes it is very strange to read offensive comments just because of a st***d "phone" that just makes calls...if it is samm or apple... ...so darkkjedii - am i the first jackass according your techie mind? No not at all, but a mind as obviously intelligent as yours should handle this topic from a broad base. I'd like you to come on this site more often, it's a refreshing change from the normal idiocy, that infests Phonearena. i like your comments very very much..."bro"
Former Apple boss Steve Job's reaction to this latest news: "...Well, they should be GRATEFUL! The conditions there in China are way better than here in HELL!" 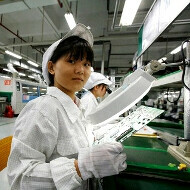 Boycott apple until they fix it, force them to move ALL production to its home country, or put them out of business. Nothing against production in China if the working standards meet international standards, or, better, OSHA standards. Very true. They should be kicked out from China for paying so low to workers!